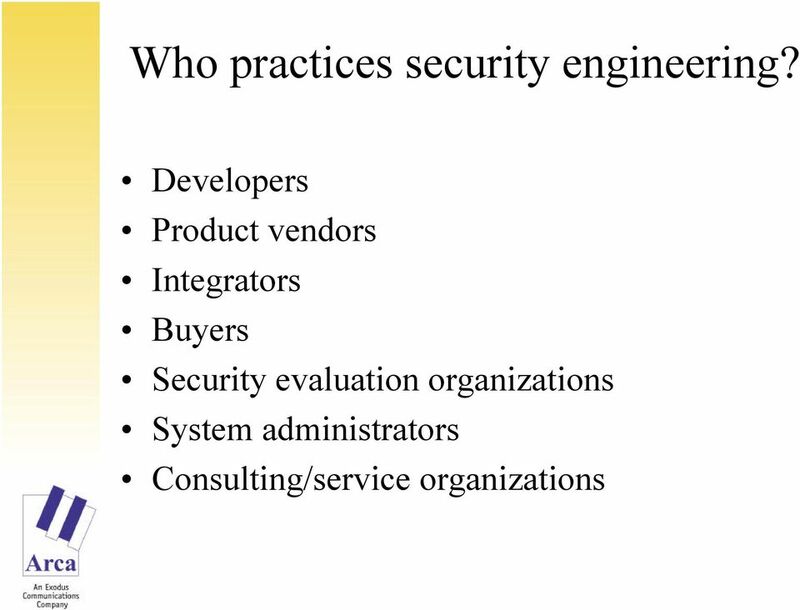 Download "Security Engineering Best Practices. 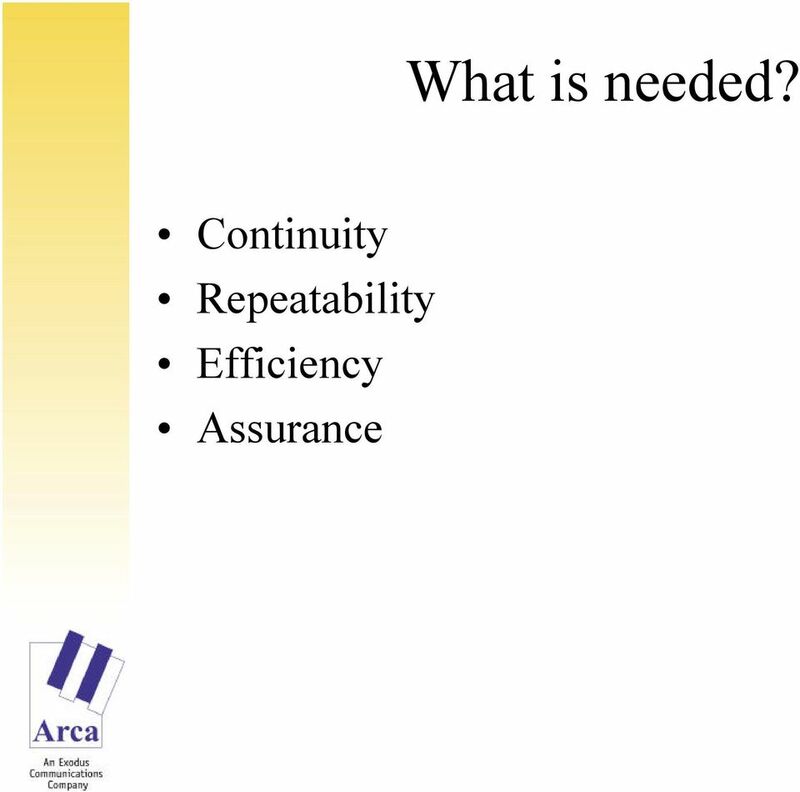 Arca Systems, Inc. 8229 Boone Blvd., Suite 750 Vienna, VA 22182 703-734-5611 ferraiolo@arca.com." 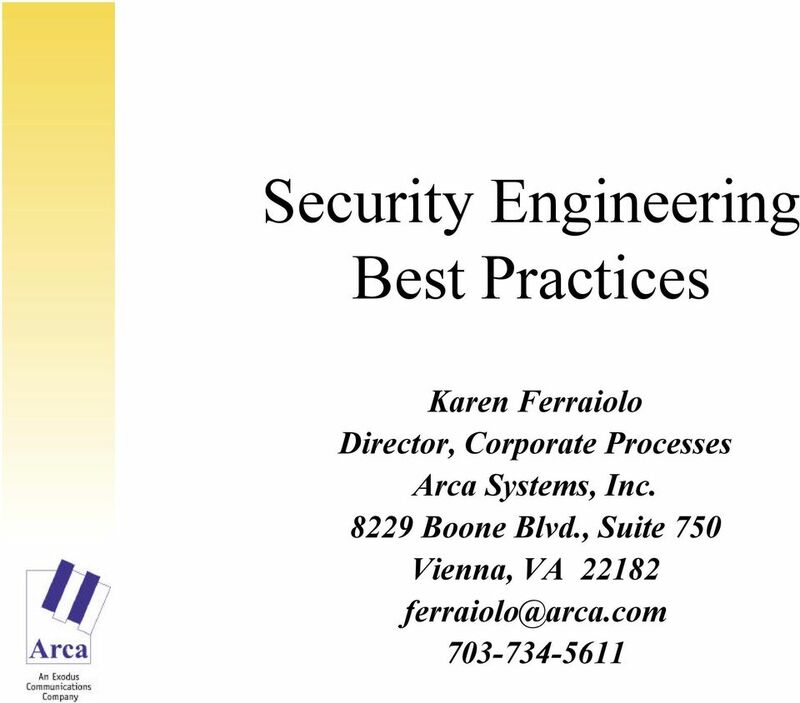 1 Tutorial: Instructor: Topics: Biography: Security Engineering Best Practices Karen Ferraiolo, Arca Systems, Inc Boone Blvd., Suite 750 Vienna, VA This tutorial will discuss the need to have defined practices that can help organizations focus their investments in work processes for developing and maintaining secure systems and trusted products and in providing security consulting services. 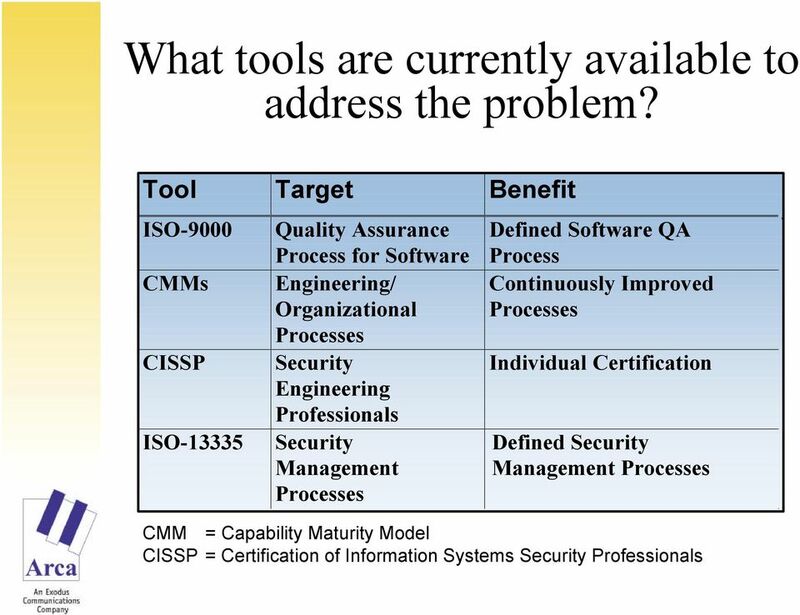 In addition to defined practices for security engineering itself, measures can help organizations determine their capability and improve. 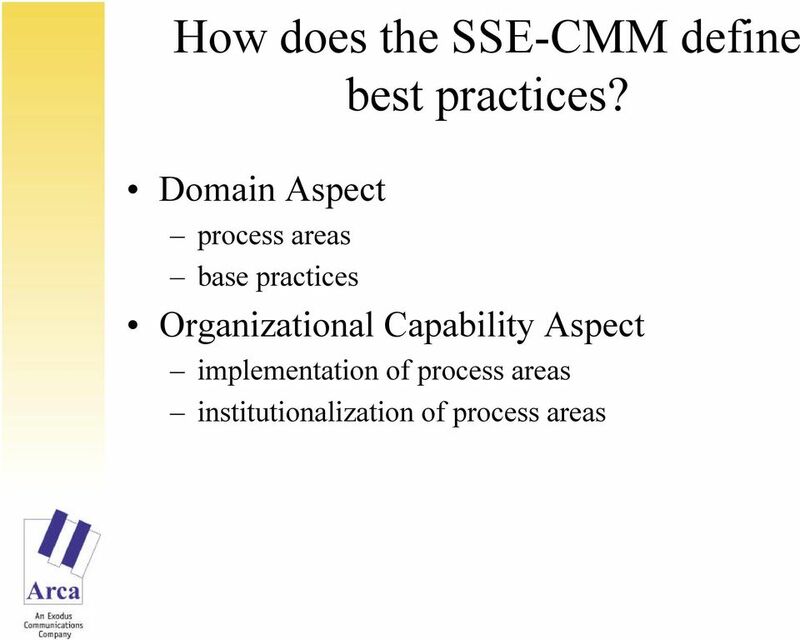 The Systems Security Engineering Capability Maturity Model (SSE-CMM) defines both security engineering base practices as well as capability measures for enabling organizations to discover and define best practices to support their needs. 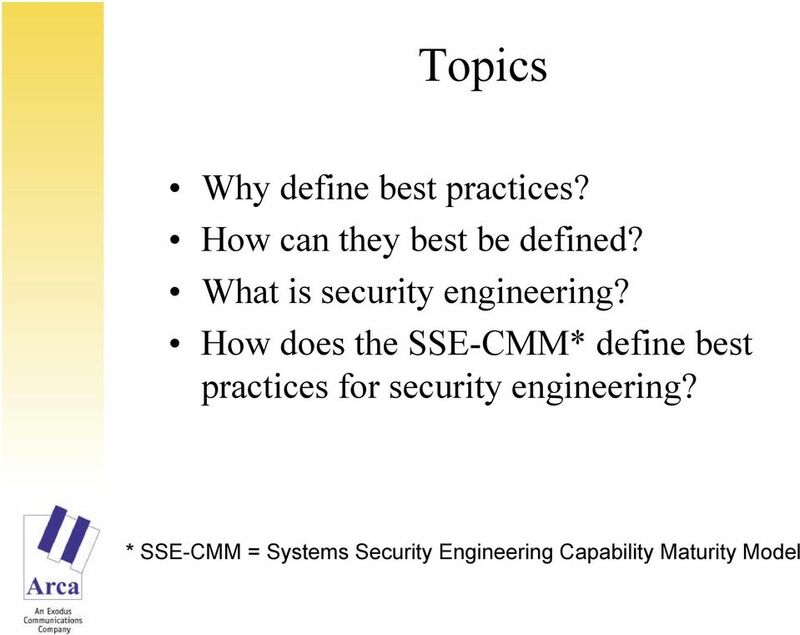 The following topics will be addressed: Why define best practices for security engineering? How can they best be defined? 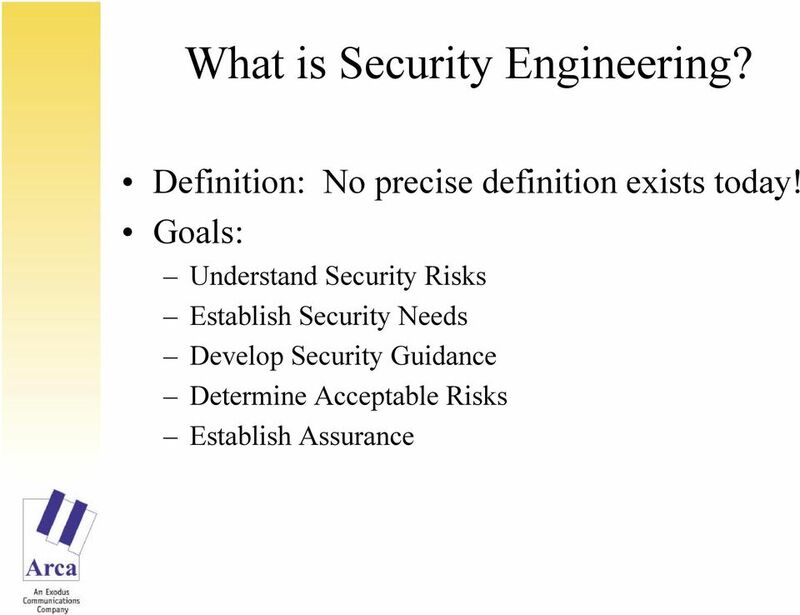 What is security engineering? 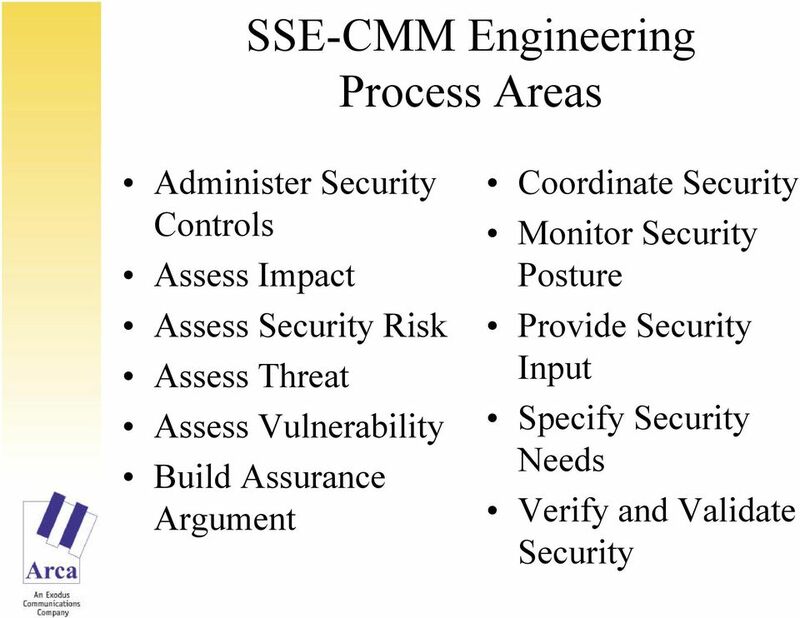 How does the SSE-CMM define best practices for security engineering? 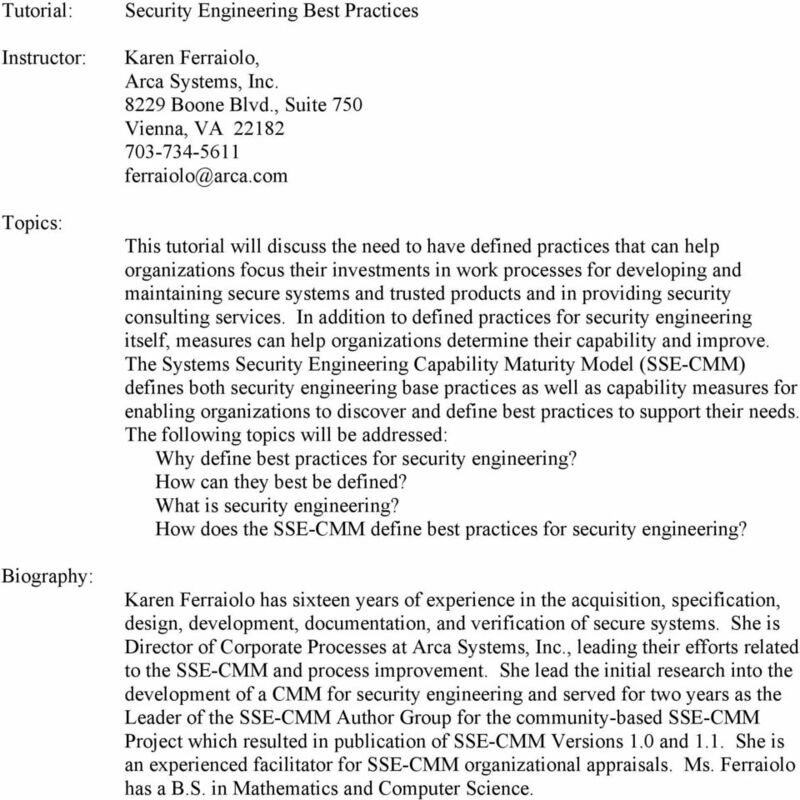 Karen Ferraiolo has sixteen years of experience in the acquisition, specification, design, development, documentation, and verification of secure systems. 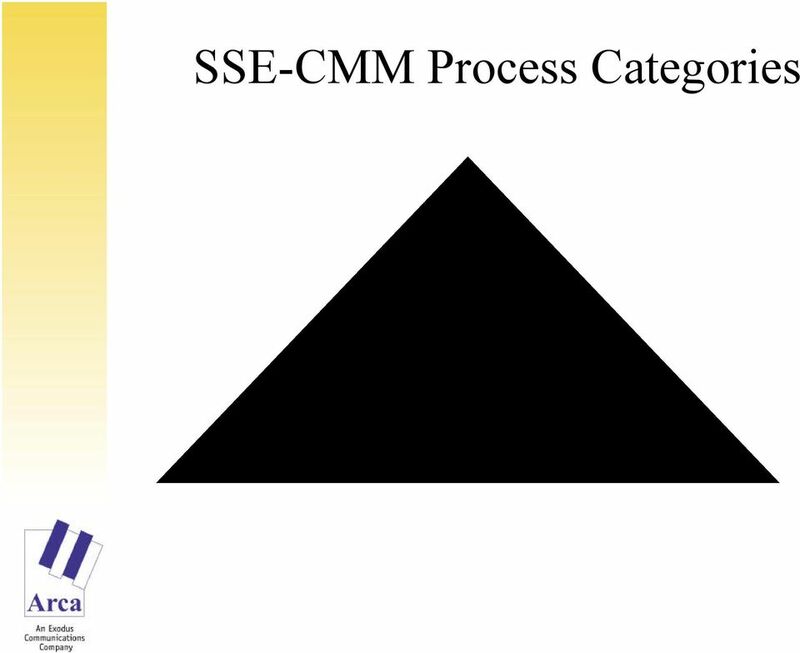 She is Director of Corporate Processes at Arca Systems, Inc., leading their efforts related to the SSE-CMM and process improvement. 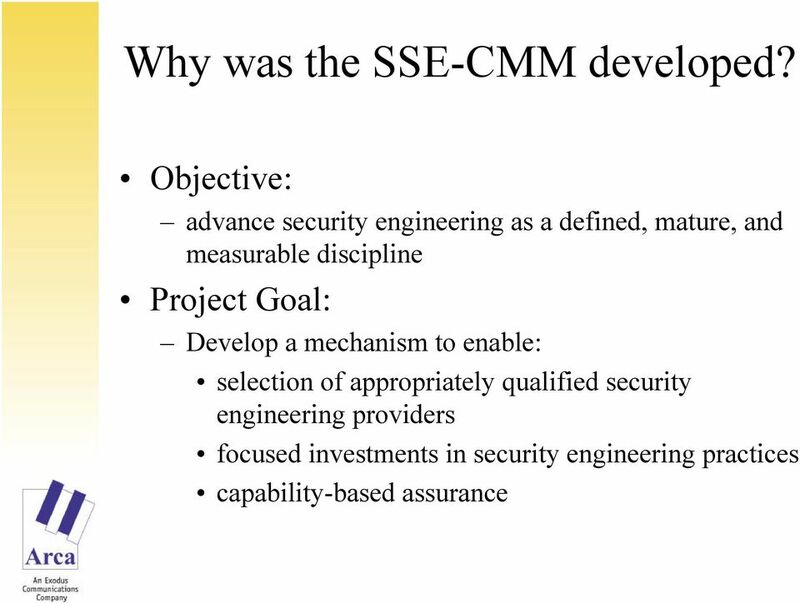 She lead the initial research into the development of a CMM for security engineering and served for two years as the Leader of the SSE-CMM Author Group for the community-based SSE-CMM Project which resulted in publication of SSE-CMM Versions 1.0 and 1.1. 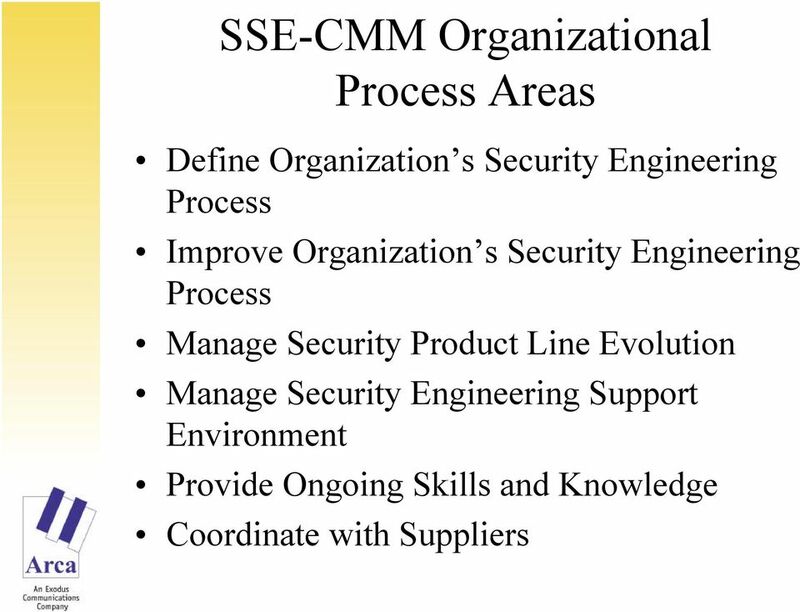 She is an experienced facilitator for SSE-CMM organizational appraisals. Ms. Ferraiolo has a B.S. in Mathematics and Computer Science. 29 What Is Assurance? 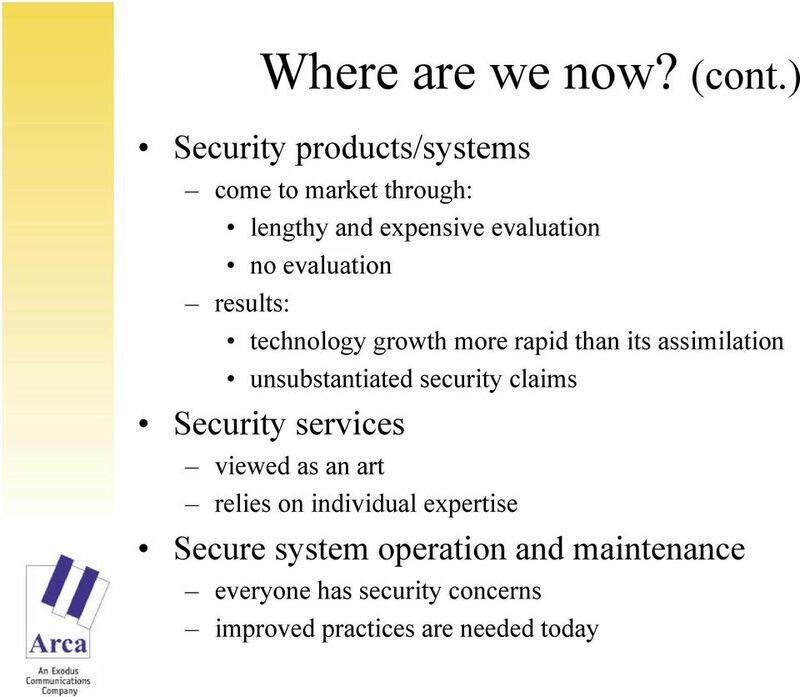 Definition: the degree of confidence that security needs are satisfied What are security needs? What is confidence? How can we measure? 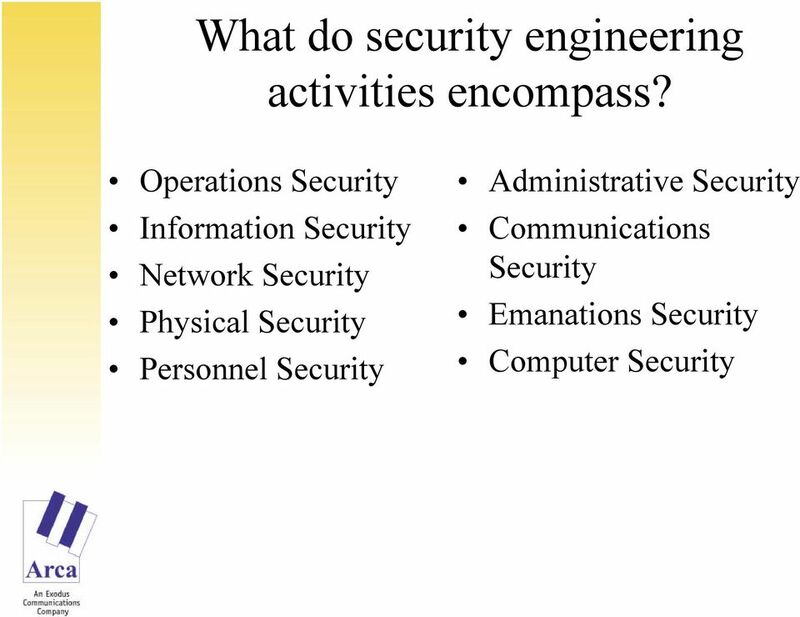 Software Engineering/Courses Description Introduction to Software Engineering Credit Hours: 3 Prerequisite: 0306211(Computer Programming 2). 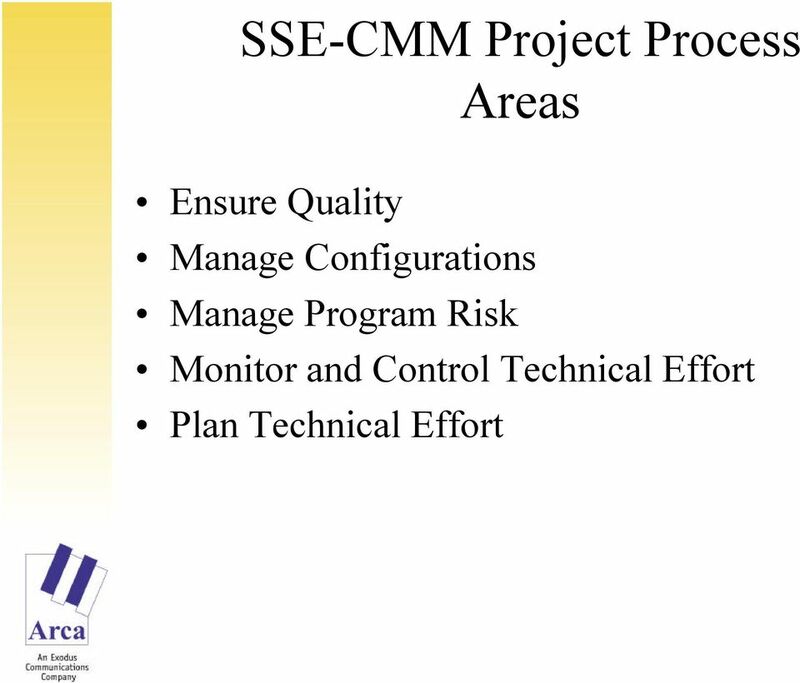 IT Services Management Service Brief Release Management Prepared by: Rick Leopoldi May 25, 2002 Copyright 2002. All rights reserved. Duplication of this document or extraction of content is strictly forbidden. 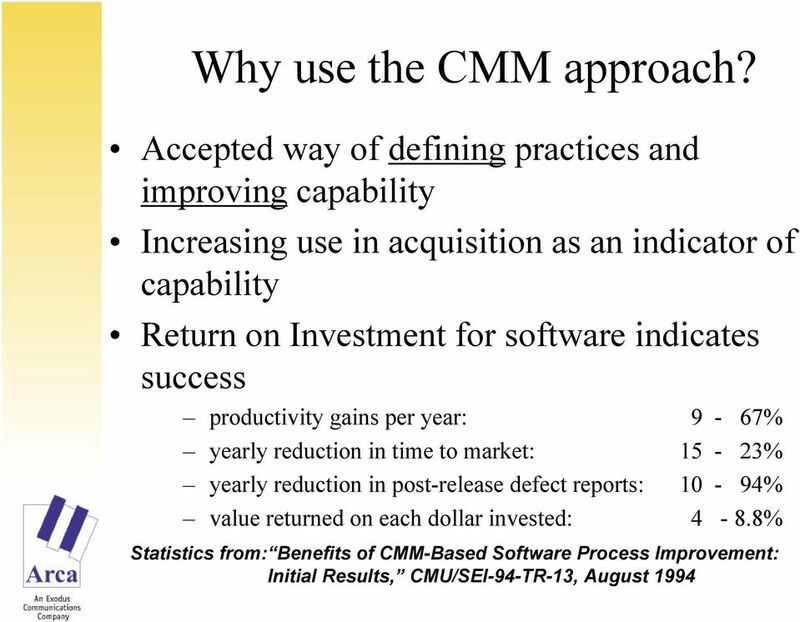 Life Cycle Models, CMMI, Lean, Six Sigma Why use them? 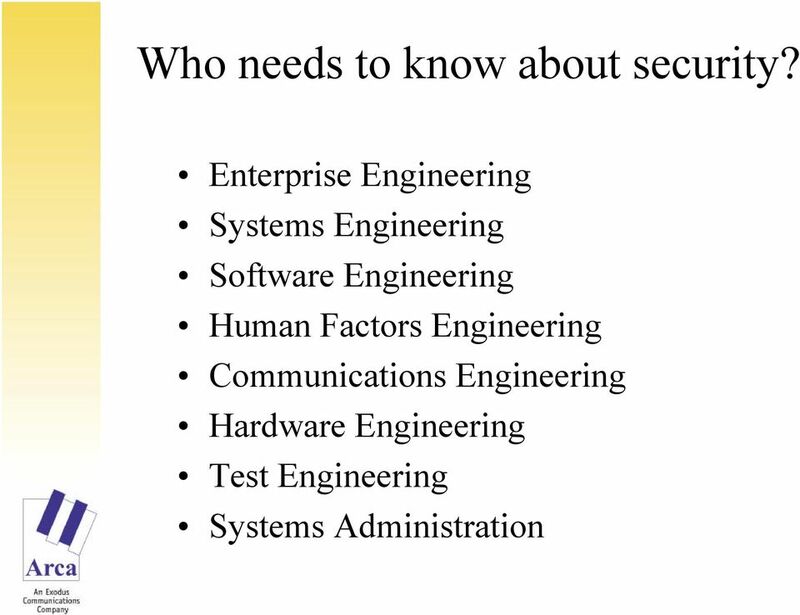 What is Automotive Software Engineering? What is Automotive Software Engineering? 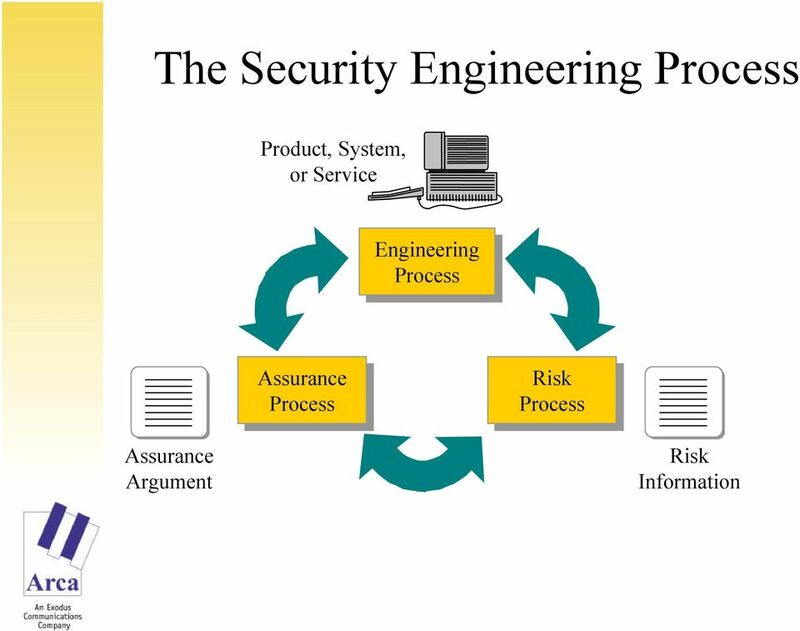 What is Automotive Software Engineering?